Lottery customers' gross profit per visit is greater than nonlottery customers. That's because the majority of Lottery customers pick up other items when they shop and make more store visits than nonlottery customers. 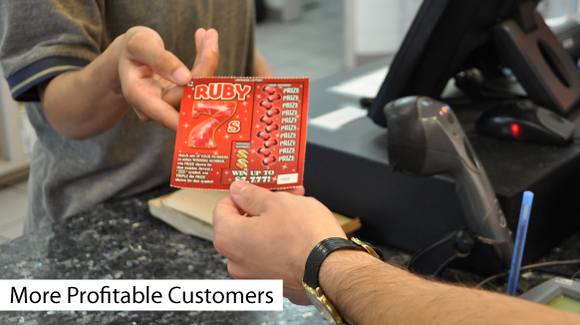 Offering Lottery products helps your business appeal to a very loyal customer segment that keeps coming back, adds fun and excitement to your store and most importantly, boosts your bottom line. Commissions. Retailers earn 5 percent commission on every ticket sale. Cashing Incentives. Retailers are encouraged to cash customers' winning tickets of up to $600. This encourages repeat customer visits and spending, while earning retailers up to a 2 percent incentive. For example, cashing one winning ticket worth $600 would earn an incentive of $12. Dedicated Customer Service. Retailers receive ongoing sales support, including in-store visits by an assigned Lottery Sales Representative and hassle-free automatic inventory management. Flexible Cash Flow. Retailers have the option to be billed for ticket packs only after a significant portion have sold, to reduce or eliminate any cash flow crunches. Plus, retailers never pay for products that don't sell. Equipment & Supplies. Equipment and point-of sale materials necessary to market and sell Lottery products is provided and serviced free of charge with 24-hour support. Retailers are charged a $20 weekly fee to defray satellite communication costs. Promotions. 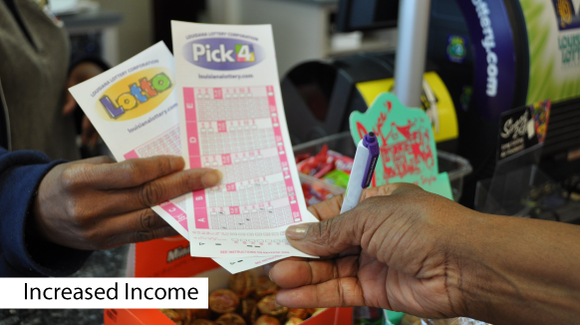 The Lottery helps retailers generate store traffic and sales with in-store promotions such as second-chance drawings and free gifts with purchases. In addition to player promotions, the Lottery aggressively supports its products with statewide advertising campaigns and social media messaging. Communications. Retailer receive the Exchange, a bimonthly newsletter about sales techniques, new products and more! 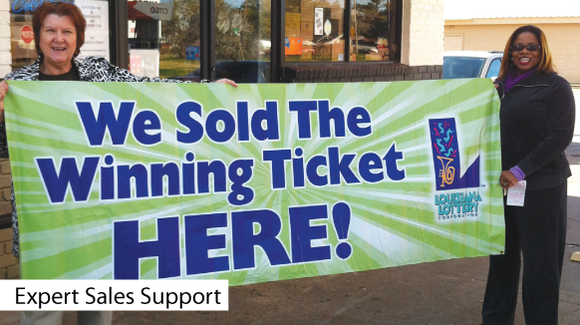 Only licensed physical retail locations located in the state of Louisiana are permitted to sell lottery products. 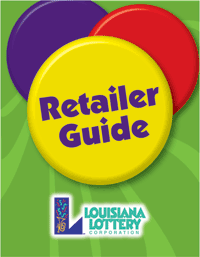 Louisiana Lottery Retailer Licenses are nontransferable and must be renewed each year prior to Dec. 31. 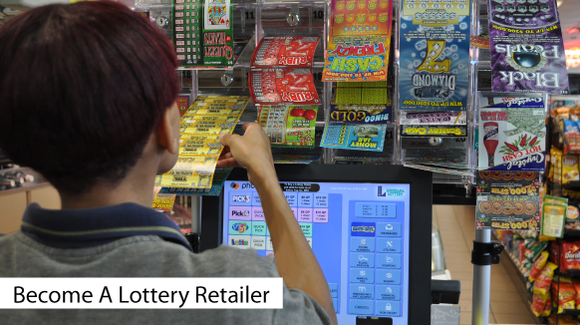 In selecting retailers for licensure, the Lottery considers the applicants financial responsibility, accessibility and security of the establishment, projected sales volume and market penetration. Before applying, businesses should ensure they have met all qualifications. 1. 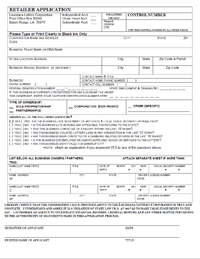 Complete theRetailer Application Packageand submit it to the address at the top of the application form, along with a $35 nonrefundable application ($10 for bonding and $25 for processing) AND required clearance letters(see below). 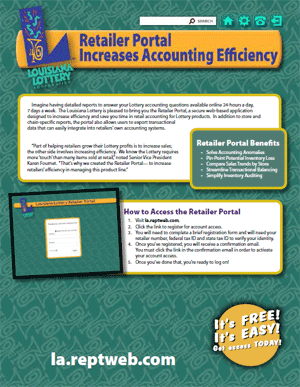 Lottery'sRetailer Regulationsper Chapter 5 of Part XV of the Louisiana Administrative Code. 4. Once a COMPLETE application is received, the Lottery will conduct an internal marketing evaluation, security background check, credit check as well as an onsiteADA inspectionof your place of business. 5. Once your license is approved, delivery and installation of your Lottery terminal equipment, ticket stock, as well as dispensers and game inventory will occur.You will be assigned a Sales Representative and mandatory employee training will be scheduled. This process is typically completed within 4-14 days. Note: Your Official Louisiana Lottery Retailer License should be displayed in a prominent area inside of your business establishment. 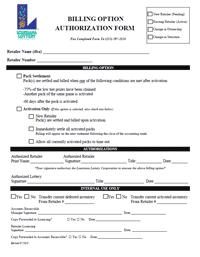 Complete ALL five forms in the application package to apply for a new retailer license; this is also required anytime there is a change in ownership. 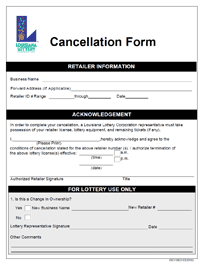 Complete this form to request a voluntary cancellation of your Lottery license; this is frequently used prior to closing or selling your business. Complete this form to change the way the Lottery bills your business for scratch-off ticket packs. 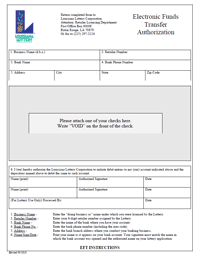 Complete this form to change the bank account used to fund Lottery transactions via Electronic Funds Transfer. Ensure efficiency and effectiveness in your Lottery sales, cashing and accounting processes by enrolling store managers, clerks and corporate staff in the Lottery's FREE training program, which includes classroom and hands-on terminal training at each of the Lottery's regional offices in New Orleans, Baton Rouge, Lafayette, Alexandria, Monroe and Shreveport. The 2-4 hour customizable course combines discussion, audio visuals, reference materials and actual hands-on training in how to use Lottery equipment. Other topics include product training, steps on how to marketing, merchandising and loading your dispensers correctly, as well as understanding the financial aspects of being a retailer, including reconciling your Lottery sales. This document contains everything you need to know to understand your role, responsibility and benefits of being a Lottery retailer, including an overview of Lottery products, sales and cashing guidelines, inventory management, accounting procedures, sales and marketing advice. The guide walks through all major topic areas covered in the Lotterys Retailer Training Program. 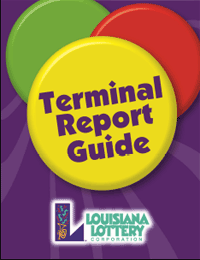 This guide features samples of the most useful reports available on retailers' Lottery terminals, including instructions for accessing the reports, a description of the information contained in the report and tips for how to use the report in the management of Lottery business. 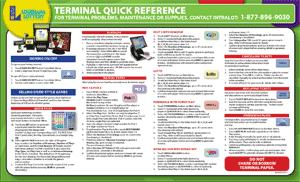 At a glance, get easy-to-follow instructions for the most popular and essential functions of your Lottery retailer terminal, including generating tickets, selling scratch-offs and managing inventory, cashing winning tickets, accessing reports and more. Keep a copy close to your terminal as a handy reference for staff. 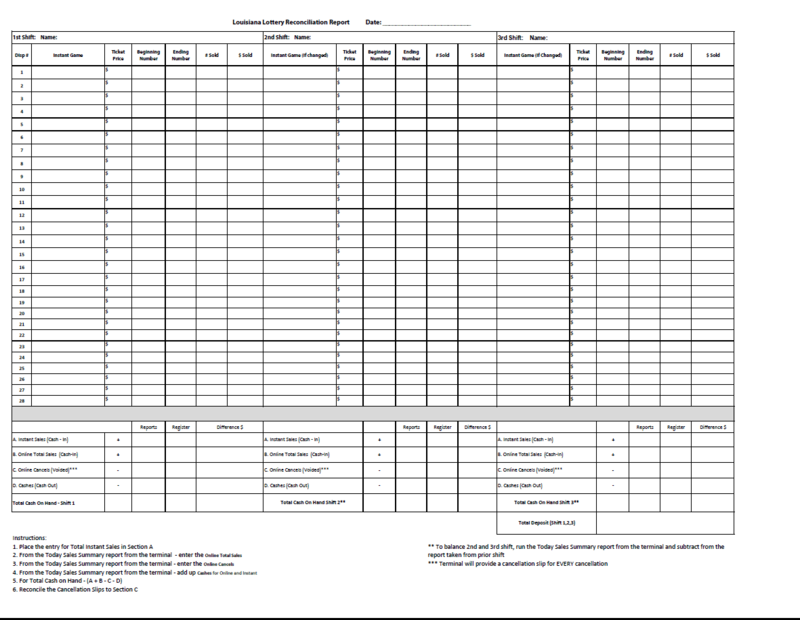 A printable form simplifying scratch-off inventory and register reconciliation on a shift by shift basis to ensure accurate accounting, a retailer requirement. Also available as customizable Microsoft Excel file. 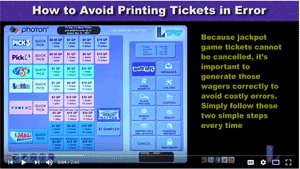 Watch videos to help you accurately create draw-style game tickets, handle tickets printed in error, load your scratch-off dispensers, evaluate compliance with the ADA, pay prizes and more! Use these documents to tour the reports available on the Retailer Portal and review steps to receive secure online account access. The Portal provides detailed store and chain-specific reporting helpful to analyzing sales trends, streamlining transactional balancing, simplifying inventory auditing and solving accounting issues. Portal users can export transactional data that can easily integrate into their own accounting systems. An electronic version of the player brochure available in your Lottery Play Center, this brochure highlights how to play each of the Lottery' s draw-style games, including prize charts for winning combinations. An electronic version of the player brochure available in your Lottery Play Center, this brochure outlines the red flags of common prize notification scams and provides consumer protection information. 1. The retailer agrees to operate in a manner consistent with the Louisiana Lottery Corporation Act, applicable federal, state and local laws, rules promulgated by the LLC and these terms and conditions. 2. The retailer agrees to notify the LLC immediately if there is any change in ownership, location or financial status of the entity issued a lottery license. If the retailer is convicted of a crime in any judicial jurisdiction or becomes delinquent in payment or filing of taxes to any authority where the retailer is selling tickets, the LLC must be notified in writing within ten (10) calendar days. 3. The retailer shall prominently display the Official Retailer License and Official Retailer door decal. The retailer agrees that tickets may be sold only at the licensed location, and the license may not be transferred. 4. The retailer agrees to use a ticket dispenser for the sale of tickets in a prominent location near the cash register or checkout. An equipment deposit may be required for any dispensers or other quipment provided to the retailer by the LLC. 5. The retailer agrees to prominently display point-of-sale materials provided by the LLC, including door decals, game posters, display tickets, danglers, change mats, and lighted interior signs, unless exceptions are obtained in writing from the LLC. 6. The retailer agrees to make lottery tickets available for sale during the retailer's normal business hours and provide for the redemption of winning tickets during the same hours, subject to LLC operational limitations for validation approvals. The retailer may not charge a fee or surcharge as a condition of redemption. 7. The retailer agrees to pay any prize of $50.00 or less. 8. The retailer agrees to obtain a bond, letter of credit or other financial guarantee, or participate in a self-bonding program established by the LLC. 9. The retailer agrees to notify the LLC within 24 hours of any lost, missing or stolen tickets. The retailer is responsible for all tickets delivered upon acknowledgment of receipt. The retailer shall provide reasonable security for all tickets and LLC property. 10. Failure of a retailer to order and/or accept delivery of instant tickets for any sixty (60) day period may result in a suspension and a thirty (30) day probation period. 11. The retailer agrees to maintain accurate and complete records of all transactions with the LLC and to make such records available to authorized representatives of the LLC during normal business hours. 12. The retailer agrees to offer no less than four (4) instant games for sale to the public at all times if four (4) or more games are available from the LLC. Retailer agrees that the aggregate number of dispensers will be determined by the Lottery using sales analysis. Tickets may not be sold to anyone under 21 years of age. 13. The retailer agrees to make a full financial settlement with the LLC for all tickets received in a timely manner as prescribed by the LLC. The retailer agrees to maintain an electronic funds transfer account in an institution insured by the FDIC. The account will be capable of electronic funds transfer for making payments of all sums due to the LLC and receiving credits from the LLC. In the event the retailer maintains more than one EFT account, any account may be used to satisfy all amounts due to the LLC. 14. The retailer acknowledges that the funds collected herein through the sale of lottery products or any other game offered by the LLC, constitute property of the LLC, and that any terminals, equipment, supplies, or promotional material provided by the LLC, is at all times herein property of the LLC. Further, the retailer acknowledges that the funds collected on behalf of the LLC shall not be subject to pledge, mortgage, hypothecation, loan, or encumbrances, to any third party. 15. Retailer agrees to notify the LLC of any change in its credit facility, loan structuring or refinancing of its business entity, within thirty (30) days of said change. 16. Retailer shall notify any lender or issuer of credit, that funds collected as a result of the sale of lottery products, are not part of any collateral offered to creditor to secure financing, or additional lines of credits issued to retailer, and as such are specifically exempted from any calculation of value of collateral by any creditor providing or issuing credit to retailer. 17. Retailer acknowledges that he has a fiduciary responsibility to hold all funds collected on behalf of the LLC, in trust as set forth in La.R.S 47:9055, et seq. 18. Skimming of lottery proceeds is the intentional excluding, or the taking of any action in an attempt to exclude, anything or its value from the deposit, counting, collection, or computation of gross revenues or net proceeds from lottery activities, and constitutes a crime as provided in La.R.S. 47:9073. 19. Tickets may not be sold for more than the price established by the LLC. a.) Commission of a violation of the Retailer Regulations, the Louisiana Lottery Corporation Law or administrative regulations adopted pursuant thereto or other provisions of Louisiana Law. b.) Failure to accurately account for lottery tickets, revenues, or prizes as required by the LLC. c.) Commission of any fraud, deceit, or misrepresentation. d.) Insufficient sale of tickets. e.) Conduct prejudicial to public confidence in the LLC. f.) The retailer filing for or being placed in bankruptcy or receivership. g.) Any material change in any matter considered by the LLC in executing the contract with the retailer. h.) Failure to meet any of the objective criteria established by the Board of Directors pursuant to the Retailer Regulations. 21. The retailer understands that the retailer will receive a commission of five percent of net sales of lottery games sold at the licensed location. 22.The retailer agrees to pay any weekly communications charge which may be assessed for each on-line gaming terminal installed at the licensed retail outlet. 23.The retailer acknowledges that pursuant to Article C, Section 1. of the Louisiana Lottery Corporation On-Line Retailer Selection Policy Statement, "The Corporation shall review the performance and profitability of the On-line Retailers on a periodic basis. The Corporation reserves the right to terminate the retailers status as an On-line Retailer for purpose of relocating the terminal to a more profitable retailer location." 24.The retailer agrees to send at least one person to training sponsored by the Corporation. The Corporation, at its discretion, may waive this requirement for Retailers who have previous lottery experience. a.Louisiana Lottery Corporation Law, La. R.S. 47:9000 et seq. c.Louisiana Code of Governmental Ethics, La R.S. 42:1101 et seq. 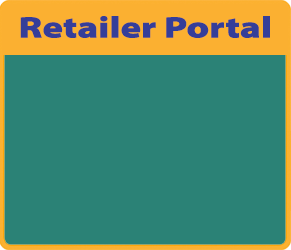 Retailers can access detailed inventory reports, sales records and transactional data to manage their Lottery product line via our secure Retailer Portal.